Sideways trends occur when the currency trading price that is seen in the chart is relatively flat and does not present neither an uptrend nor a downtrend. Sideways trends are important in between points that can be used by the trader to evaluate how the currency trading market is going to behave. If the market had a long uptrend then the sideways trend can indicate of a change in direction of the currency price movement. The opposite is true of course of downtrends that precede sideways trends. There are two kinds of sideways trends - tops and bottoms. These trend types can not only point to a change in the currency price direction, but can also only be a pause in the direction. 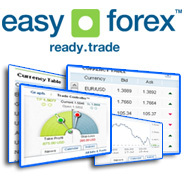 In this case, the currency trading price is expected to continue its former trend after the sideways trend ends.